E-Conference!? Technology for the good! "It is a big honor to receive a reward of the community for all the work I have been doing the last 21st years on development". On the 21st May 2010 Simon Koolwijk received the Knight of the Order of Orange Nassau (Ridder in de Orde van Oranje Nassau) from the Alderman of Hengelo, Janneke Olde-Allink in the library of Hengelo. Simon was proposed by members from Stichting Kapiniand Stichting Pearl of Africa. Both foundations support Kawempe Youth Centre in Kampala, Uganda which is a community based project in Kawampe subdivision to build literacy under youth. Simon was the last 10 years board member and chairman / treasurer for 10 years with Stichting Kapini. Digital video as a tool for learning! From 14 to 23 April 2010 a delegation composed of 20 people from Moldova attended The Netherlands to learn more about community youth development work in the Netherlands. The delegation included youth leaders, representatives of youth centers, NGOs, the Ministry of Youth and Education, Moldova State University and the partner organization Procommunity Centre. The study visit was part of the project "Youth in the Center" (funded by Matra) which aims to strengthen community youth development work in Moldova. The project is a partnership between Kontakt der Kontinenten, Proni Centre for Social Education, Procommunity Centre and the University of Social Work, Hogeschool Windesheim. Thinking through about a capacity development intervention! "The step-by-step approach helped me to think through how to prepare and be prepared to do my capacity development intervention. The training was logical and personal." This was the comment of one of the capacity development advisors who will be working on communication for a Democratisation and Peace building network in Central America. New ideas on how to do facilitation! "I gained new ideas on how to do facilitation, I learned a lot, both on skills and methods. The training had a good balance of theory and practise. The course had a good flow and we worked in a safe and relaxed atmosphere." These were some of the comments of 6 staff from ICCOenKerkinActie who participated on 28-29 april 2010 in the training facilitation methods. In two days participants got acquainted with the basic principles of facilitation, learned new methods and gained practical experience. 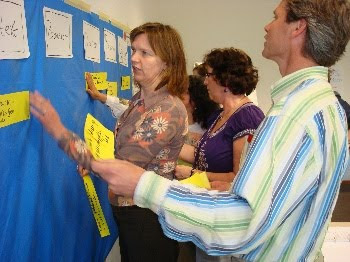 The training had a same design as the public training on facilitation in Nijmegen, 26 - 27 april.